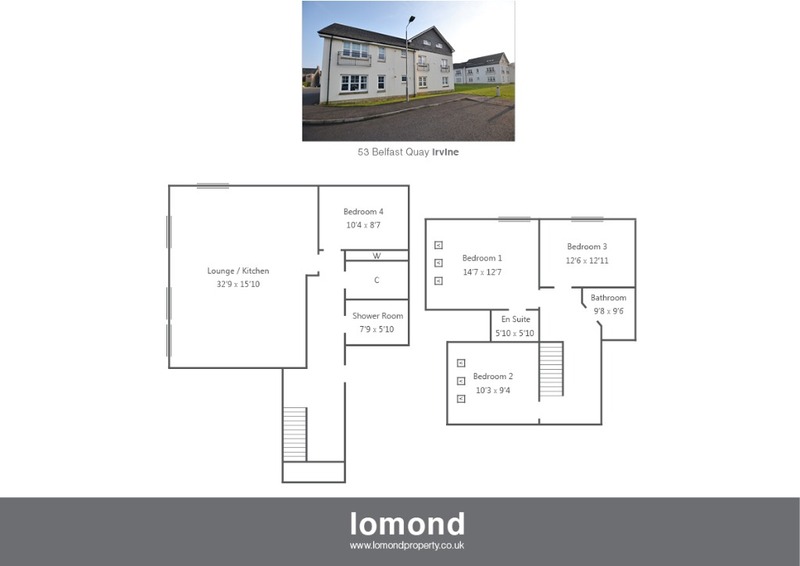 53 Belfast Quay is a stunning duplex flat situated within the popular Moorings Estate at Irvine Harbour, just a short walk from the train station. The property comprises of four double bedrooms, large open living room/kitchen with shower room, bathroom and master en suite. Externally the property benefits from manicured garden grounds, residents parking, and secure door entry. In summary the property layout extends to a secure door entry with stairs to the first floor. The apartment itself comprises of an entrance hallway with two storage cupboards off, and stairs to the upper level. The main living room is stylish with neutral décor throughout. The kitchen area is open plan to the living room and comes well stocked with floor and wall mounted units, integrated fridge, freezer, dishwasher and washing machine. Further benefits include breakfast bar with seating space for 4-6 people. Bedroom 4 is situated on the lower floor, and comes with fitted wardrobe space. Completing the ground floor is a stylish shower room, with WC, and WHB, all finished to modern tiling. The upper level houses three more bedrooms and a family bathroom. The master bedroom benefits from a luxury en suite shower room, and is wonderfully lit courtesy of 3 velux windows. Bedroom 2&3 also feature fitted wardobe space. The family bathroom is beautifully presented with corner bath, led floor level lighting, WC and WHB. The property benefits from gas central heating, and double-glazing throughout. Belfast Quay is a residential area. Irvine town is close by and provides access to a range of amenities including supermarkets, bars, restaurants and town centre shopping. There are a number of local primary and secondary schools within the Irvine area.